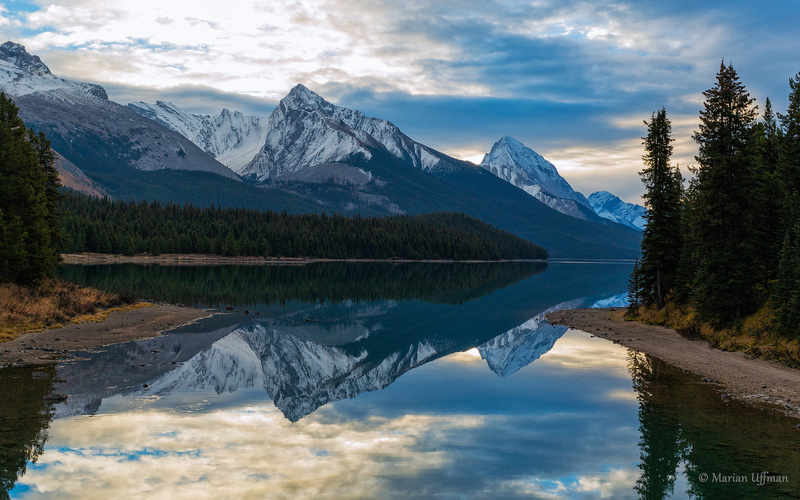 On a cool, crisp morning on Maligne Lake near Jasper, Alberta, we waited for the sun to come up before we went in search of moose to photograph. While we soaked in the beautiful scenery, Marian quietly went about her business moving her tripod loaded with her Canon 5dIII and a 17-40 L f/4 lens to a spot where the reflection would be most perfect. Using Liveview to set the best exposure to capture the reflection, light of the clouds and the beautiful mountains, she clicked the shutter. Liveview is an excellent tool for such tasks as you can see from the results. Using Liveview was one of the topics covered by Chas Glatzer in his Shoot the Light workshop held in this beautiful venue. Of course when the sun came up, we did move off in a successful search to find a moose family that we knew frequented the beautiful lake area.